Have updated the Reviews tab with some feedback on various stories from the last couple of anthologies I featured in. Always good to hear feedback and critic, whether it’s good or bad. Much appreciated. 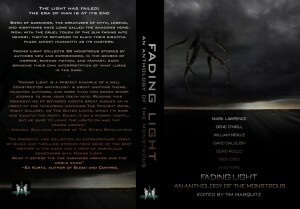 Angelic Knight Press have today announced that there’s been a manufacturing mistake by CreateSpace with the first print run of the ‘Fading Light’ anthology, and being the awesome small press that they are, they’ve already taken steps to sort it all out for anyone who’s ordered or recieved a defective copy from Amazon. For the full story and how to go about getting a replacement, check out the latest post over at Angelic Knight here. UPDATE: This issue has now been fixed and the print edition is once again available to purchase from Amazon. My review of ‘The House of Rumour’ by Jake Arnott is now available over at the BFS website. Link added to the tab above as normal. Out today is Tim Marquitz‘ monstrous anthology ‘Fading Light‘, released by Angelic Knight Press and featuring my contribution: ‘The Beastly Ninth‘. The anthology is available in paperback from Amazon.co.uk, and in electronic form from both Amazon.co.uk and Smashwords. In addition, there is a ‘Companion’ electronic edition, containing five further stories which couldn’t be included in the main book for space reasons. It’s available for a fraction of the price, from both Amazon.co.uk and Smashwords, and serves as a great teaser purchase for those unsure about buying the full anthology.